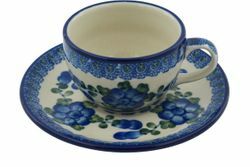 Polish pottery Cup & Saucer. Hand painted by artists in Boleslawiec region of Poland, Polish pottery holds both heat and cold for extended periods. Each stoneware Cup & Saucer is hand crafted at famous Ceramika Artystyczna factory. The superior quality of Polish stoneware makes this teacup perfect for every day use.